“The Original Sarsi”. That’s what I have in front of me today. Technically it’s F&N Sarsi but I honestly don’t know if that makes a difference. You see this can of Sarsi is from Singapore, brought to me by the MMAgician. F&N Sarsi is manufactured and distributed by Coca-Cola Singapore Beverages Pte. Ltd. I’m guessing it’s a fairy mainstream drink over there. Maybe I’ll do a little more digging on Sarsi. If you find these next few sentences <surrounded by alligators> informative at all that means I did in fact do some digging. <Sarsi, it’s just so fun to type, is a sarsaparilla based beverage sold in South East Asia. 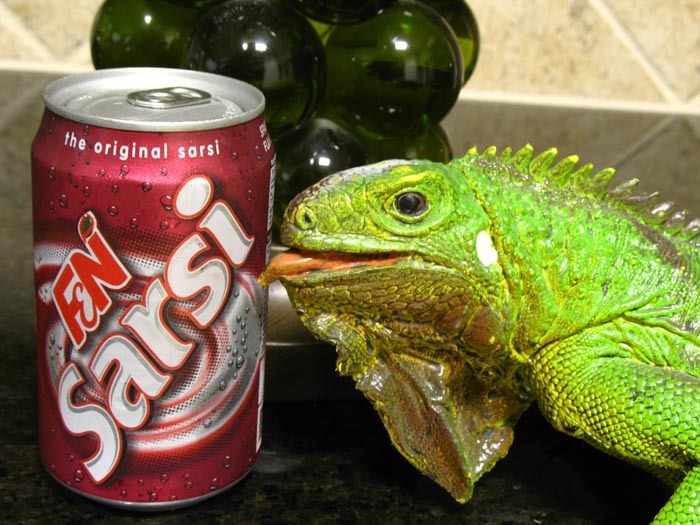 Ok, we’re making some sense here… Sarsi/Sarsparilla… I see what they did there. Fun fact! According to Wikipedia, Sarsi was the subject of a 1985 film called It’s a Drink, It’s a Bomb, where a grenade was disguised as a can of Sarsi.> Sarsi seems to have a pretty short ingredient list. Let’s read shall we? Carbonated Water, Sugar, Flavourings, Caramel, Citric Acid and Preservative. They seem to hide stuff a little better over in Singapore. I know not if the “Flavourings” are naturally or chemically spawned. I also don’t know what the “Preservative” is. It could be formaldehyde or Sodium Benzoate. Fingers crossed for formaldehyde! Seeing as I don’t know what Sarsi should even begin to taste like (since I haven’t looked it up yet as of typing this) I’m interested to open up this stumpy maroon can. One. That was the most difficult opening of a can I’ve ever been a part of. Two. This smells like dreams. Sarsi smells of root beer, Dr. Pepper, and peppermint, COMBINED! While intrigued even more I’m now experiencing a bit of fear as well. Ah well, who else can say that they’re drinking a Singapore soda today? NOT YOU! Unless of course you’re reading this in Singapore… in that case thanks for the readership you handsome/beautiful devil you. Whoa… that tastes nothing like Dr. Pepper or peppermint. Sarsi tastes of carbonated black licorice with a hint of root beer. Mike (remember Mike?) says that birch beer tastes of licorice, while I thought it tasted so similarly to root beer that they wasted time re-naming it birch beer. There were fights abound on the subject, one eventually coming to fisticuffs. Sarsi on the other hand tastes like they soaked a handful of black licorice jellybeans in a diluted root beer concoction. If you remember from the research above you will understand that half of my review isn’t that far off. Sarsi is a sarsaparilla based soda so that explains the root beer. I guess one of the “flavourings” could be licorice but we’ll never know. Thanks Coke! Thoke! Sarsi’s carbonation to flavour ratio works very well for itself, but carbonation sits on the back burner when you have such an interesting flavour as we do here. With that said Sarsi is in fact very different from anything I’ve tried up to this point. While my joy of drinking it has increased throughout this review, I just can’t see myself purchasing a pack of Sarsi. Therefore. Twist's blood is actually Sarsi, but not the kind you find in stores... the life granting kind.